The Amsterdam Diaries is a blog with a focus on hidden, intimate or new hang-out options in Amsterdam. It consists of eight videos, all shot within the city center of Amsterdam. It’s presented by Kate van Dam, a born and raised ‘Amsterdammer’ who promises to keep the viewers up-to-date on the most authentic places in the city. The videos featured on the blog are all shot as selfies, often with the assistance of a selfie stick. However, the places that the blog features are well-known, the brands are not that new, and the hang-out options are ones every tourist knows about like Dam Square, Heineken and the Flower Market. Essentially the blog mocks other bloggers in Amsterdam who claim to know the best-kept secrets of the city, as well as the ‘selfie’ and tourist cultures that are very common in big cities nowadays. Our aim and why ‘The Amsterdam Diaries’? Popular Amsterdam bloggers such as ‘Amsterdam Curated’ and ‘Your Little Black Book’ serve as the inspiration for The Amsterdam Diaries. These bloggers present themselves as experts of the new places and best things to do in Amsterdam. They gain popularity by representing a strong ‘authentic online identity’ (Lenhart 2010). This corresponds with Lenhart’s claim that “A blogger wishes to represent an idealized version of an authentic-seeming self” (55). Vlogs can be seen as an unique medium for self-presentation and interpersonal perception in social media. This goes beyond the use of text and still photos, and explains the popularity of this format among online video users (Biel et. al 2011). 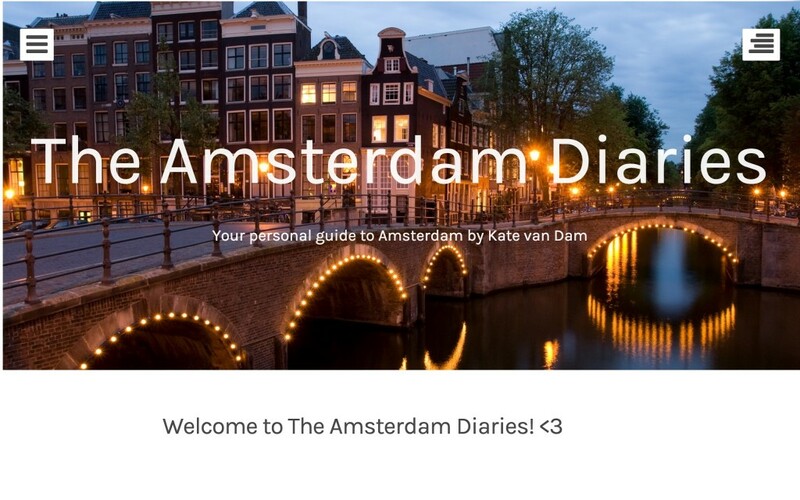 We tried to make The Amsterdam Diaries and Kate van Dam seem as real as possible. While Kate presents the most touristic and ‘well known’ places as quiet hidden treasures in Amsterdam, this project intervenes between authenticity and popularity within the bloggers and self-filming vlog culture. Whilst creating the blog and shooting the vlogs, we paid attention to the mechanisms and features to the ‘staged authenticity’ of Kate van Dam. In our documentation we explain how all these elements contribute to the authenticity of the starting blogger Kate van Dam and her identity of The Amsterdam Diaries. On the About Page of The Amsterdam Diaries, Kate van Dam introduces herself. This gives the visitor the chance to get to know ‘the real Kate van Dam’. Her picture is shown in the introduction and a mailing feature is embedded for questions and feedback. This gives the reader the sense of being able to interact with a ‘real’ person. Interaction can also be found in Kate’s vlogs where she greets her followers. According to Lenhart this contributes to the honesty and authenticity of a blog: this gives the reader the sense of being able to interact with a ‘real’ person (78). To fulfill the bloggers image of Kate and to gain popularity for The Amsterdam Diaries, Kate is on Instagram and YouTube too. Her video’s are shaky and often shot in bad angels. 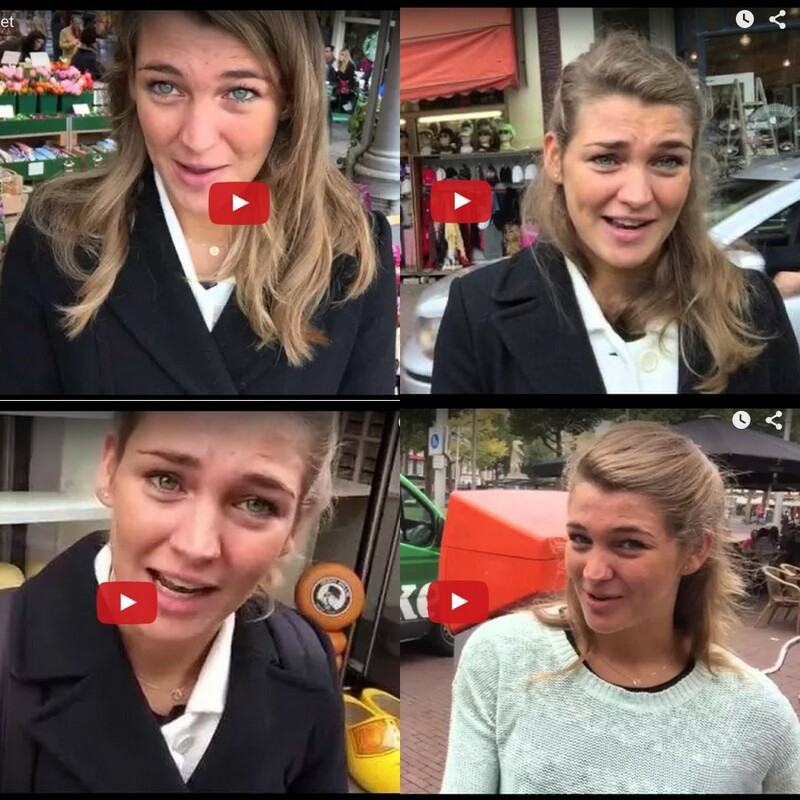 Some of them are filmed vertically, giving the impression that Kate van Dam is a starting blogger. Not all videos are high-definition videos which confirms her amateurism. The fact this is done with a selfie stick, corresponds to the ongoing debate about the selfie culture. The concept of a ‘selfie’ emerged in an age where digital technology has been developed to the level where we all constantly wear technologies with us that allow us to take photos from ourselves. Levin (2014) mentions the concept was pronounced ‘word of the year’ in 2013 by the Oxford English Dictionary. For him, “selfies have assumed a place of privilege in the dialogue concerning how digital media affects behavior” (Levin 2014). He mentions McLuhan (1994), who foresaw how “technological prostheses” affect the individuals who appropriate them: “the electronic extension of individual consciousness results in a new kind of self-consciousness” (Levin 2014). Marwick (2015) connects the idea of this selfie culture to an ‘attention economy’ (138). She quotes Fairchild (2007) when she describes this attention economy as “a marketing perspective assigning value according to something’s capacity to attract “eyeballs” in a media-saturated, information-rich world” (138). The debate of the selfie culture is connected to The Amsterdam Diaries, because it can be seen as a critical reflection on how the contemporary bloggers position themselves. By using selfies, The Amsterdam Diaries fits within the current debate on selfie culture in a way that the medium affects behaviour. For instance, Kate makes sure to show herself from her best side in every video, thus affecting her manners. The term popularity refers to the liking of, or positive attitude towards a subject. In the context of The Amsterdam Diaries, popularity plays a role on two levels. Content-wise, we decided to focus on popular hangout places and brands in Amsterdam, and present them as up and coming tourist attractions. On the blog level, we made the blog appear to have a real-time growing followers base. By doing so, we looked into the role popularity plays in blogs and content, and how a newly-created blog can recommend its followers where to go and what to do in Amsterdam and influence their decision. The Amsterdam Diaries project consists of a WordPress blog, an Instagram account and a Youtube Channel. The blog hasn’t gained a lot of popularity and followers, as this never was the intention of this project. The Amsterdam Diaries can be considered as a playful and critical project, in where we experienced how ‘authenticity’ can be staged or constructed within the context of blog culture. It shows also how vlogs as a medium can represent a version of an authentic self. The Amsterdam Diaries ended up as critical work which aims to mock the current popular Amsterdam Blogs by questioning their authenticity of their self-representation. The vlogs of Kate van Dam form a satire on their identity and content. Furthermore, for the people visiting the blog and watching the vlogs, this project aims to raise questions. A good example is the vlog on Rembrandtplein, where Kate falsely states the ‘Nachtwacht’ is painted by Vincent van Gogh. Whilst shooting this vlog, bystanders felt the need to correct what Kate told the camera. In this documentation video, Anne explains the processes behind the scenes and our idea of this project. Biel, Joan-Isaac, Oya Aran, and Daniel Gatica-Perez. “You Are Known by How You Vlog: Personality Impressions and Nonverbal Behavior in YouTube.”ICWSM. 2011. Lenhart, Amanda, et al. “Social media and young adults.” Pew Internet & American Life Project 3 (2010). Levin, A. “The Selfie in the age of Digital Recursion.” InVisible Culture: An Electronic Journal for Visual Culture (IVC) (2014). Marwick, Alice E. “Instafame: Luxury selfies in the attention economy.” Public Culture 27.1 75 (2015): 137-160. Interesting article, gives you a new view on vloggers.